Today we’d like to introduce you to Joe Rindone. 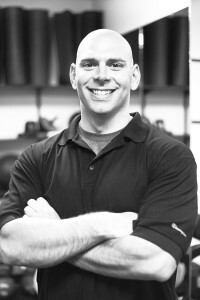 I started Personal Training in 2007, while living in Boston. I went to a vocational school for Personal Training and added on many specialty certifications throughout my five few years of training. After renting space from various locations to train my clients, in 2012 I decided to open Back Bay Fit on Comm Ave in the Charlesgate community. I created the gym to offer the best private training experience in Boston. Not only did my clientele grow but there are now seven of us training at the facility today. In addition, I grew up in Arlington MA (about 7 miles west of Boston) and from social media / word of mouth my Arlington clientele was growing quickly. So in 2015 I decided to open another Back Bay Fit in east Arlington on Mass Ave. near the Cambridge line. We currently have five trainers at the studio and also run some Small group Training at that facility as well. I definitely had my share of obstacles to hurdle. Social Media is a great marketing tool but to get to the next level, you definitely need a good website and presence on review sites. Finding the right teams to know your business and work on this was a good obstacle that we still sometimes fight with today. In addition, as trainers we are always so busy with clients and the other day to day responsibilities of running two gyms, that trying to work Reviews/Testimonials can be a complete afterthought. Scheduling time to work on a little extra day to day things is very important! Alright – so let’s talk business. Tell us about Back Bay Fit – what should we know? Back Bay Fit is a small studio, where we make sure each client is a name and not a number. The trainers that work at Back Bay Fit all work independently and are true veterans in the industry. What we offer in comparison to any other studio cannot be matched. Every trainer truly cares and thinks about their clients daily. We take focus on dedication and reaching goals week to week. In addition, the facility itself is just a fun, great atmosphere. We keep the gym extremely clean, equipped with the best equipment and make it the premiere private training facilities we claim them to be! A lot of credit definitely goes to the trainers at both Boston and Arlington locations. Without their daily commitment, Back Bay Fit does not exist. When I first got started my teacher at my Personal Training School, Graeme Prue was very motivating and supportive. Training clients came naturally right out of school, yet there were always a few curve balls thrown. Graeme was a major help my first year in the field.